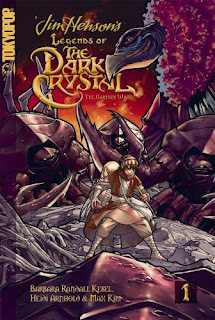 I got a chance to read Legends of the Dark Crystal volume 1 today, and thought I'd provide a review. Because I know you've all been eagerly anticipating one from me! Let me start off by saying that Jim Henson was one of the good ones. He was a guy who really and truly wanted to make the world a better place, and just loved what he did. Do you remember his show Fraggle Rock? It came about because Jim said to his crew, "Let's make a show to bring peace to the world." He wasn't naive enough to think that he could literally accomplish that, but that was still his honest goal. I have a lot of respect for Jim's sincerity and integrity. He had this uncanny ability to tap into an almost Jungian collective mythology, and create stories that were timeless and touched people in powerful ways. What's more, he was able to see that in other people and help bring it out to present to the world. And, existentially speaking, that's where Dark Crystal came from. In part, because of his design work on Dark Crystal and Labyrinth, I'm also something of a fan of Brian Froud's artwork. (Although his Pressed Fairies book was what really put him over the top in my mind.) He has a gift for making fantastical creatures, both the beautiful and the ugly. So between Henson's ability to tell a wonderful story and Froud's incredible designs, Legends of the Dark Crystal had an absolutely amazing starting point. Which, of course, is a blessing and a curse. It's a blessing in that there's plenty of rich depths to draw out more great stories, but it's a curse in that there's a high standard to live up to. Jim himself saw exactly that in making the various sequels to The Muppet Movie. I had heard of problems with Tokyopop's extension of Labyrinth and avoided that, but I gave veteran writer Barbara Kesel the benefit of the doubt here in picking up Legends of the Dark Crystal. The story takes place years before the movie. The Dark Crystal has already shattered, but the Skeksis have only just begun capturing Gelflings for their life-perpetuating "essence." Lahr and Neffi managed to escape from raids on their respective villages, and are able to make it another settlement before it, too, is attacked. After some debate, the villagers opt to hold their ground and fight off the intruders. Kesel knows how to write; she's proven that several times over before now. Legends is no exception. Solid characterization across the board. Good dialogue that moves the story along without unnecessary exposition. It's clear she's well-versed and comfortable in the Dark Crystal universe. Heidi Arnhold and Max Kim's artwork is good, too. Very clear storytelling -- even during some potentially tricky spots -- and good use of grey tones to bring out some of the linework. There's also a great consistency of character designs -- I'm never at a loss for who is being portrayed in any given panel, despite seeing whole villages of Gelflings. The new creature designs, too, are clever and blend in quite well with previous Henson/Froud material. In fact, the only real complaint I can muster against them is that some of the illustrations of Gelflings look a tad off-model, with their heads looking more rounded than elliptical. Given, though, that there are thousands of drawings of Gelflings throughout the book and only a few of them stand out as "off", it's a really minor grievance. The other issue I have is with Tokyopop itself. Specifically, that they're selling this as manga. They've got their "Leading the Manga Revolution" stamp on the back cover and the whole bit. Now I'll grant that, on the whole, people (well, Americans at any rate) don't use the term "manga" very accurately. It's just the Japanese word for "comic books" and I've actually heard it used exactly that way in conversations held in Japanese. I can forgive a little confusion here, as one can't generally tell where a comic originates just from looking at it. So lumping manhua and manhwa in with manga is, though somewhat condescending, understandable. I can even see OEL manga where there's clearly a strong influence from Japanese artists. But I've got to say, with Legends of the Dark Crystal, there's very little Japanese influence to it. It could just as easily have been printed in a pamphlet format -- indeed, each chapter is exactly 26 pages -- and sold for three bucks an issue. What about a larger format TPB for $16? The only reason this is getting racked as "manga" is because Tokyopop is printing it the same size as their other manga books. Why do I care? It's graphic storytelling, and it shouldn't matter what format it takes so long as it works for the story, right? For me, personally, it doesn't really matter that much. I've got enough other manga books at this point that I've got space set aside for the more compact format. But it seems to me that some of the people picking this up are going to be folks who just enjoy Henson material. And those people are likely NOT going to have space set aside for something like this, and it further seems unlikely to me that they're going to be so enthralled by the format that they're going to pick up other manga series. Sorry. Bit of an aside there that doesn't really have much to do with Legends itself. Legends of the Dark Crystal is a really good read. It plays off the movie well without re-treading familiar ground. Anyone who enjoyed the movie will almost undoubtably enjoy this. If you're a fan of fantasy stories generally, I think you'll enjoy this as well. Good stuff, and I'm eager to see volume two.